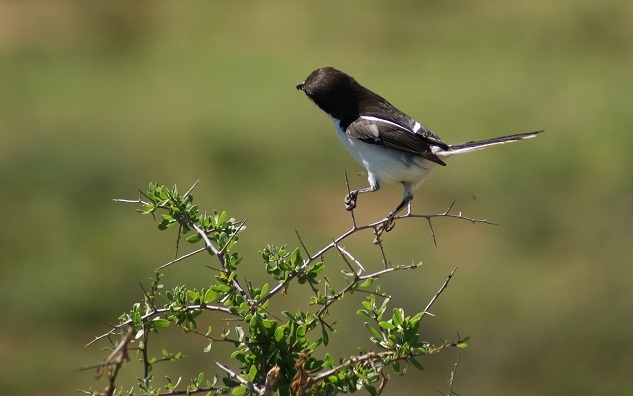 Formerly known as a Fiscal Shrike, the Common Fiscal (Lanius collaris) is ubiquitous throughout South Africa and is commonly seen hunting from exposed perches. It is also common in gardens. This ringed Common Fiscal is investigating the food tray in my garden. 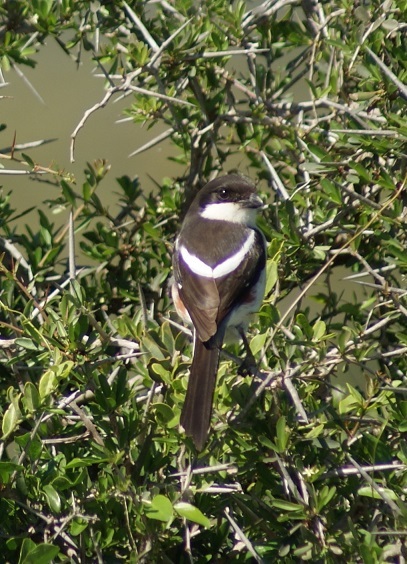 This back view of the Common Fiscal shows the characteristic white ‘V’ on its back. You can clearly see its hooked beak and the distinctive narrow white outer tail feathers in this side view. Here you can just make out the chestnut flanks of the female. 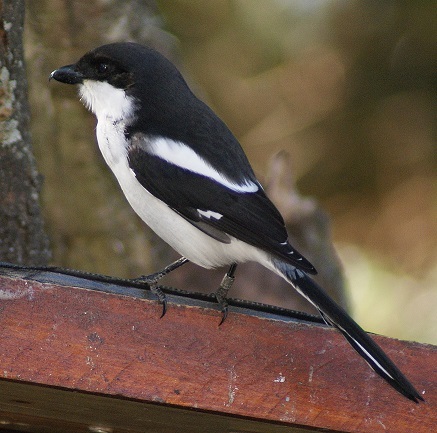 This entry was posted in Birds and tagged fiscal shrike. Bookmark the permalink. These are stunning photos, Anne! Thank you: it is a ‘stunning’ bird! Wonderful photos of this beautiful little bird! Thank you – they are more difficult to photograph than one might think. Very pretty bird. I love the way it delicately grasps the spikey bits of its perch! And beautifully photographed. For such familiar birds I don’t really have many photographs of them, Anne, but you have a lovely collection! Thank you Dries. As you know, they tend to fly off as soon as they sense a lens is pointing their way! Great photos. 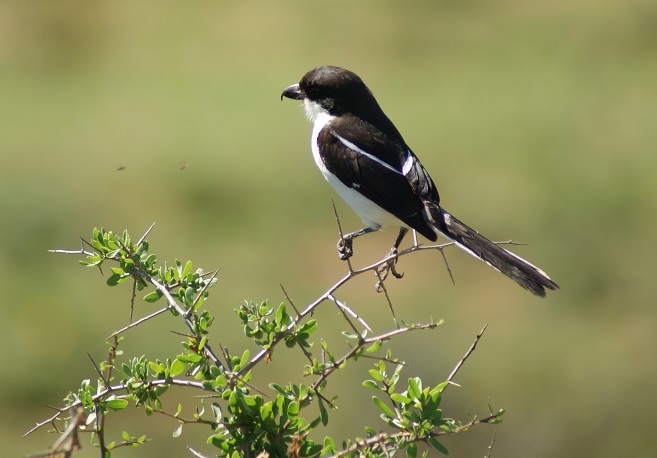 Similar to our Shrike with its impressive beak for such a small bird. 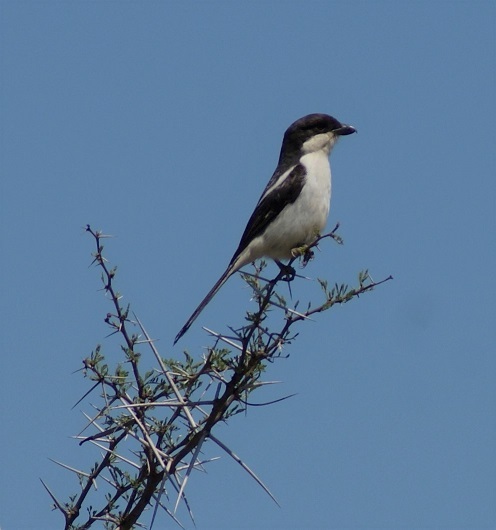 That robust hooked beak IS very impressive and is typical of shrikes, as you mention. What a beautiful bird! I don’t think I’ve ever seen one of those, but I hope to catch a glimpse of it someday.